The newly constructed New Berlin WWTP utilites and equipment area was in need of make-up air to replace exhausted building air in the space and also to prevent freezing of the pipes. They chose an AbsolutAire AA1-UVX for this application. 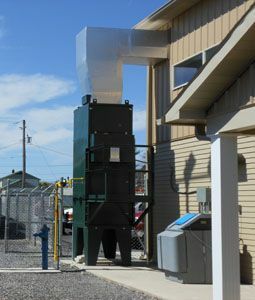 Construction features of this equipment included a spark resistant fan, low leak, spring return discharge damper, and explosion proof controls that were mounted in the space. A VFD was also included to vary the airflow speeds during various seasons. During the winter months, the fan runs on high speed to properly heat the space. A room override stat allows for an even higher increase in the discharge air temperature when personnel are working in the building. During the warmer summer months, the VFD drops down to low speed, as not as much heat is needed in the space. An override switch running on a three hour timer was included, however, so that the fan could also run at high speed, if needed, in the summer.